Rock Canyon Poets reading at the Utah Arts Festival this Friday! Rock Canyon Poets are proud to announce they will be reading poetry at the Big Mouth Stage on Friday, June 22, 2018 from 1:00 to 1:30 p.m. as literary artists for the Utah Arts Festival. You can read about our 2015 performance in this Daily Herald Article: Newly formed Rock Canyon Poets perform at Utah Arts Fest. Rock Canyon Poets boasts diverse membership, ranging from 19 to 72 years in age with many backgrounds–including literary journal founders, editors, ex-military, business professionals, a playwright, and a periodontist. Individually, they have received several awards and been published in magazines, anthologies, journals, chapbooks, and full-length books of poetry. Rock Canyon Poets offer poetry with the tactile clarity of tin-can messages through fuzzy strings to the ears of an audience. These poems are tumbleweeds in semi-truck grills. They get stuck in your teeth, build bridges of spun sugar, and make it possible to mount a camel without a sturdy ladder. The Utah Arts Festival takes place Thursday, June 21 – Sunday, June 24, 2018, 12 noon to 11pm, on Library and Washington Squares in downtown Salt Lake City (200 East 400 South, Salt Lake City, Utah 84111). Co-founded by Bonnie Shiffler-Olsen and Trish Hopkinson in 2015, Rock Canyon Poets was established to develop camaraderie among Utah Valley poets, provide consistent workshopping and reading opportunities, and promote the disciplined study of writing poetry as a serious art form. 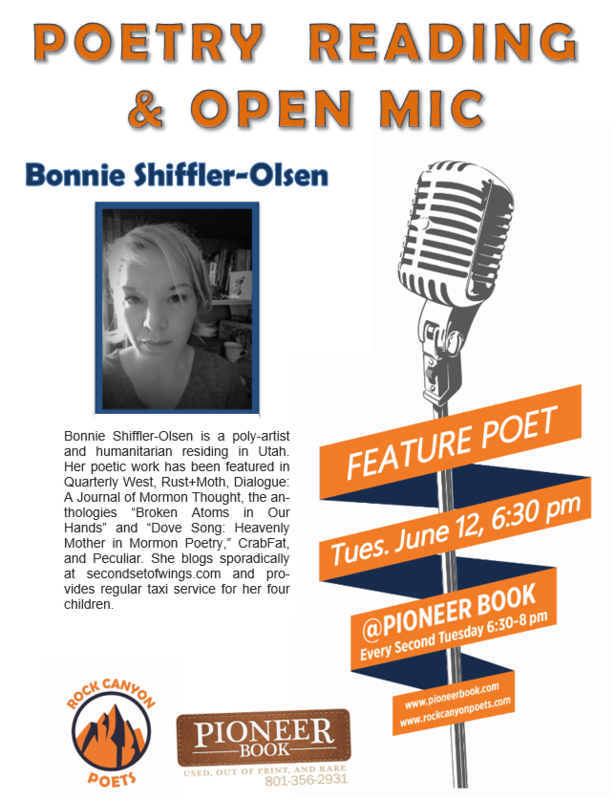 Members meet twice a month at Pioneer Book in historic downtown Provo. The group sponsors poetry readings and an open mic on the 2nd Tuesday of every month. Membership is by invitation or portfolio submission only.